Talking to the heroes of French Counter-Strike. The recent success of G2 has marked one of the most exciting developments in professional CS. Barely scraping into the ESL Pro League finals in May, G2 shocked onlookers by dominating their group pool. After defeating Fnatic they went toe-to-toe against the world number one, Luminosity Gaming, in a thrilling five-match finale. Though LG took the crown in May, the ECS Finals in June provided the perfect opportunity for revenge, and this time the French did not falter. During the tournament, G2’s Adil ‘ScreaM’ Benrlitom and Richard ‘shox’ Papillon discussed the revitalisation of French CS. As a star player, adored by fans for his legendary one-taps, Benrlitom presents a surprisingly reserved persona bordering on shy. Speaking after G2’s quarter final victory over NiP, discussion of his expectations is assured, but equally restrained. This quiet level of confidence is echoed by G2’s captain, Richard. Both men give the impression that they believe strongly in their team, but clearly understand the level of work needed make it to the top. This shared ideology is core to G2, and reflects the long history between the players. Both men have had long careers in French CS, and much of that has been spent together. If one thing has been established by G2’s recent performance, it’s that Richard and Adil, both players of phenomenal skill alone, combine to form one of CS:GO’s most formidable double acts. This team-wide positive approach is is core to G2’s survival as a French squad. Despite a dizzying amount of talent, French CS has always been hindered by near incessant roster changes, swapping players back and forth between teams. 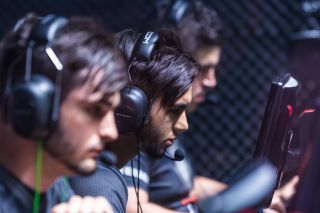 By ensuring good communication across the team, G2 have established an extremely dangerous roster, with SmithZz, RpK and boddy all offering standout moments at the ECS Finals. As captain, Richard is keen to highlight the rest of the team. With strength in unity and victories over the best teams around, G2 have shot up the rankings, dragging France back to the limelight. If their recent form is maintained, G2 look to be serious contenders for the CS throne.